Log a New Dive Site! The boat ramp at Depoe Bay is a good place to check gear out before diving offshore. If conditions are lousy, you can spend an enjoyable hour searching around underwater for cast off junk from the industries that have occupied the world’s smallest harbor. The boat ramp in Depoe Bay is a good place to check your gear out before going for a dive offshore. Even though the site is shallow, you can enjoy some time underwater here testing out gear. There is a fair amount of junk underwater left from the old businesses that used to be around the harbor. 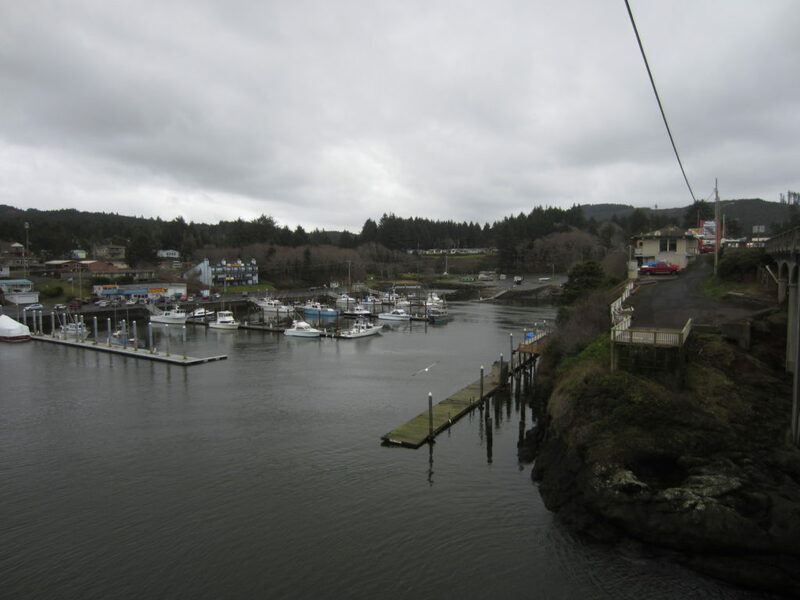 The boat ramp is right in the middle of Depoe Bay. From US101, take Schoolhouse Street east and then then turn left onto Shell Avenue. The boat ramp and parking are right at the end of the road. There usually is plenty of parking here. Just make sure not to occupy boat trailer parking. We haven’t had to pay here before but double check the signs to make sure something hasn’t changed. Imagery ©2017 Google, Map data ©2017 Google. The boat ramp is a bit cramped and shallow. You could explore more to the north although there is a lot of junk underwater and some old line. Head south to get out of the water. Head north in search of deeper water. We suggest you stay out from underneath the boats. Along the western edge of the harbor there is a lot of junk underwater. Don’t get entangled in anything! You can get in right at the boat ramp or over the little jetty to the right of the boat ramp. It’s an easy entrance/exit. This is a salt water dive. This is a shore dive. Depoe Bay is very protected once you’re inside the channel. Watch out for boat traffic. It isn’t a bad idea to have someone on the shore to let boaters know you’re underwater. 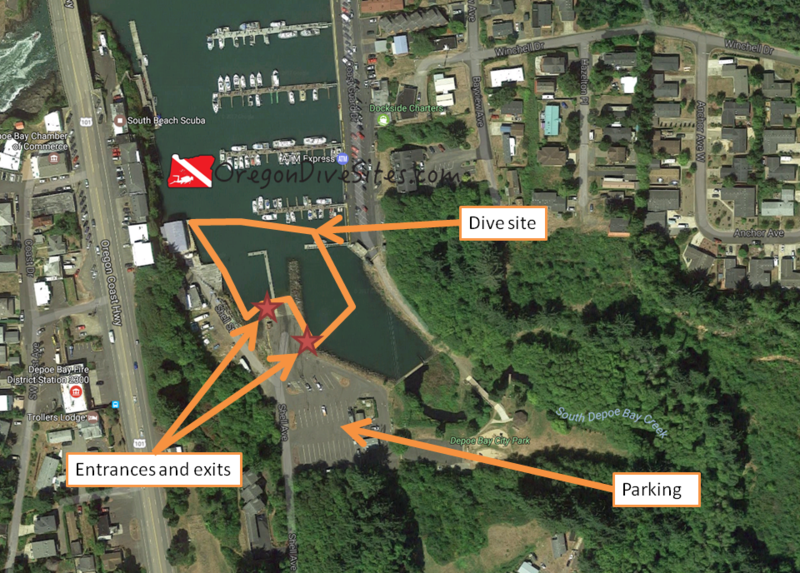 This harbor is pretty tight to fly a dive flag but it isn’t a bad idea. We have a favorite flag we use all over Oregon on our Gear We Use page. Usually you’ll get 5-10 feet of viz here. The bottom can get stirred up especially on the right side of the dive site where the little creek comes into the harbor. It can be between 45 and 65F depending on the time of year and how shallow you go. Water conditions are usually better in the winter than summer but you can dive this site at any time of year. If you go north far enough, you might find 20 feet of water but usually you’re going to be in about 10 feet of water. Buoyancy control is critical here. Open water divers can dive here but be careful with underwater entanglement hazards and sunken machinery. It’s a good idea to carry a good dive knife and line cutter. This is a pretty easy dive but be careful of entanglement hazards. Boat traffic can also be an issue. 50 feet is usual but 150 feet could happen if you have to park a ways away. No real surface swim is necessary here. Be careful of underwater entanglement hazards. Also watch for boat traffic. There used to be a dive shop in Depoe Bay but it was in the process of closing when we were last at this site (February 2017). However, they may still be giving air fills. Otherwise, you need to head up to Astoria, down to Port Orford, or inland to Portland, Salem, or Eugene to get an air fill and have gear serviced. Tidal Raves has absolutely outstanding food and a great ocean view. Gracie’s Sea Hag has the best clam chowder on the entire Oregon coast. South of Depoe Bay is Beverly Beach State Park where there is good camping. We haven’t tried any of the hotels in the area so please let us know if you have stayed at one that is SCUBA friendly! Please write in the comments below your experiences with this dive site! Oregon has a lot of great diving that most people don't know about. We want you to get out and explore the wide range of diving available across the state. Alpine freshwater lakes to offshore saltwater reefs await SCUBA divers! Enter your email address to subscribe to Oregon Dive Sites and receive notifications of new dive sites in Oregon as soon as we post them. We are two divers who call Oregon home. We have gone diving all over the world but love diving in Oregon the most. We hope that you find the this site useful as you explore Oregon! Copyright 2017-2019 Oregon Dive Sites. All rights reserved. Please read our Legal and Disclaimer page.